Treat time! 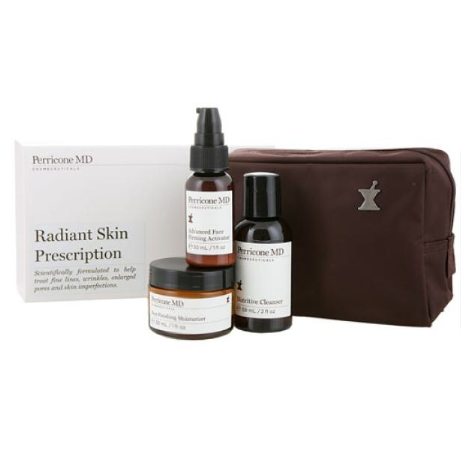 I have a guest review for you today – the wonderful Jane from Modesty Brown (www.modestybrown.com) has given a thorough testing to Perricone MD’s Radiant Skin Prescription set. Perricone MD is a brand that I rate really highly, but I have never been able to get past the fishy smell in some of the products! So thank you, Jane, for such a comprehensive review – amazing to see such clear differences to your skin! “I’ve been trying the Perricone MD Radiant Skin Prescription for just over a month, so it’s time to report back on how I got on. The set contains travel size versions of the Nutritive Cleanser, Advanced Face Firming Activator Lotion and Face Finishing Moisturizer. All of these are good size travel pots and I have enough left for at least another month’s use. I was particularly interested to try this set as it gave me the opportunity to try the Advanced Face Firming Activator. Having read London MakeUp Girl’s excellent review, I was certain that this would improve the texture of my 35+ skin. The active ingredients in the Activator serum are Glycolic Acid, Alpha Lipoic Acid and Dimethyl MEA (DMEA). A couple of words of warning here regarding the Face Firming Activator. This serum contains Glycolic Acid so you will need to use sun protection religiously as your skin will be more susceptible to UV damage. The face cream in the set doesn’t contain sun protection so you either need to use a separate sunscreen or use a different moisturiser with SPF. Also, there’s no getting around the fact that DMEA gives the product a faint fishy smell and I realise this will be a deal breaker for some. It does contain some fragrance to mask it but this fades quickly after application. The fishy aroma also fades and I can’t detect it all after about an hour. I’m always nervous about adding too many new products at once to my routine, especially ones that contain active ingredients. So, to prevent my skin from freaking out, I introduced the Advanced Face Firming Activator first, adding the moisturiser and cleanser a week and a half later. To begin with I applied the Face Firming Activator daily but I found this left my skin feeling a little uncomfortable. I swapped to application every other day and I found this sufficient to see a difference in skin texture without leaving my skin feeling tight. I saw a difference in my skin texture within that first week. My skin looked brighter and the surface more refined. I saw an even bigger difference when I added the Nutritive Cleanser and Face Finishing Moisturizer to my routine. The Nutritive Cleanser is a foaming face wash and I realise this won’t suit everyone. I always use a foaming cleanser in my routine without any issue (don’t kill me Mrs Hirons) and I especially like this one as it smells like Johnsons Baby Lotion. For those who are interested, this cleanser contains SLES rather than SLS. The Face Finishing Moisturizer has an unusual formula and I wasn’t sure if I would get on with it at first. It’s quite a runny lotion with tiny bits of what look like undissolved powder. Like the Activator, this moisturiser contains Alpha Lipoic Acid and DMEA. Despite normally using creams, I found this lotion enough to hydrate my normal skin. It leaves my skin soft and plump without any signs of greasiness. Those with dry skin may not find it sufficiently moisturising. I got on very well with the products in the Radiant Skin Prescription set. My skin is softer, smoother and the fine lines are less apparent, particularly on my forehead. My skin tone also looks more even and consequently my skin looks brighter. This is the most significant difference for me and I believe this is down to the Glycolic Acid in the Face Firming Activator.